Double servo single frequency conversion control, bag length can be set and cutting, without air conditioning in one step, saving time and film. No empty package function. Queliao automatically shut down, and take the film cutter stop, pusher automatically fill. No air bag, do not waste packaging film, without manual feeding. Built-in temperature control module, the temperature independent PID control, precise temperature control, suitable for various packing materials. 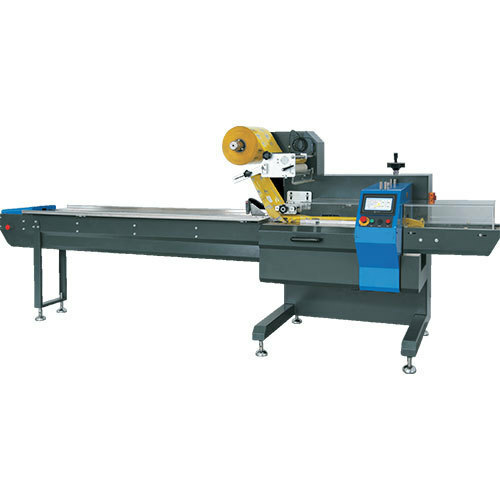 The anti-material cutting function, non-stop, to prevent cutting, improve machine efficiency, reduce equipment wear and tear. Touch interface, convenient parameter setting. Self failure diagnosis, clear failure display. End closure Gusseted set, pouch-type is more beautiful, improve product quality. Positioned stop function, no adhesive and no waste packing film. Powertrain simple, more reliable, easier to maintain and nurture. All controlled by the software to facilitate the function of restructuring and technological upgrading, never backward. We take this opportunity to introduce ourselves as one of the leading manufacturers of Automatic Form Fill Seal machines (Packing Machines) under the brand name of GEMPAC since 1992 in Kerala to pack various type of powders like Curry Powders, Spices Powders , Wheat flour , Rice Powder , Maida, Rava, Atta, Salt, Sugar, Medicinal powder etc. in poly-pouches. Apart from the above, We also manufacture machines to pack Oil, Milk, Ghee, Mineral Water, Dosa Mavu, Aval, Zip-up etc. in poly-pouches. Please note, We have supplied our machines to all parts of the Country especially to Karnataka, Tamil Nadu, Gujarat, Rajasthan, Uttrakhand, Maharashtra & Kerala States. Also regularly exporting machines to Sri Lanka, African / Gulf countries and all these machines are working satisfactorily. As far as the after-sales-services are concerned, we have a well-equipped and experienced team of engineers to look after this aspect. All our Service Engineers are staying in the Factory premises and their services will be available round the clock. Also please note that all the spares required for our machines are always available in our stock and will be supplied to you without any delay. We would now request you to send us your enquirers indicating the products/quantity etc. you want to pack enabling to send our offer. In case you need any further clarification, please feel free to contact us. To know more about our company and products please visit our website.